2.2 When should you diminish or avoid eating garlic? 2.4 Beware of garlic as a remedy applied to the skin! Garlic is a major anticoagulant. Garlic is able to thin the blood, which is extremely important in the treatment of circulatory diseases, caused by too thick blood. Considering this aspect, it is normal that garlic is presented as a good remedy to prevent blood clots and thrombi in blood vessels, which are largely responsible for atherosclerosis or hardening of the arteries, causing heart attacks, strokes, thrombosis, etc. When should you diminish or avoid eating garlic? – Problems with bleeding or blood clotting: In this case, should we should not eat garlic or take garlic preparations. – Before or after surgery: Ingesting garlic or garlic preparations could be dangerous because this may favour hemorrhages. It is best to stop taking garlic about 15 days before any surgical procedure and not take thereafter until otherwise directed by your doctor. – Garlic in pregnancy and lactation: Pregnant women can eat garlic as food in normal amounts. 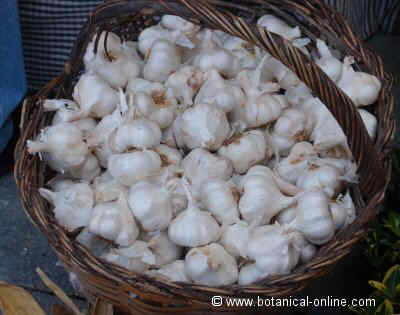 However, they should avoid garlic medicinal preparations because it has not been sufficiently studied its security level in pregnant women or nursing babies. – Some medicines may interact with garlic, such as clotting medication, certain heart medicines, certain birth control pills, etc.. It case of taking some medicine, it is best to consult with your doctor to avoid possible interactions. – Anticoagulant herbal preparations: Avoid consumption of garlic or garlic prepared with the use of other herbal preparations with anticoagulant properties. – Hyperthyroidism: Because of its high iodine content, garlic should not be taken in case of hyperthyroidism. Some people are especially sensitive to garlic. So, when they eat this food, even in not too high quantities, feel their stomach suffers, expressing heartburn, belching, flatulence or even vomiting or diarrhea. In these cases it is better to reduce the intake of garlic until those amounts in which the stomach or digestion are not affected. Beware of garlic as a remedy applied to the skin! Garlic, in external use, can cause contact dermatitis. so use it wisely. This use is never recommended for skin problems in young children. In home remedies, garlic is used as a remedy for acne or as a remedy for warts. In these cases, the application of garlic on the skin should be made according to strict guidelines to avoid causing major problems.